This is the brand new Ring to Cage Uppercut Bag!It seems like forever when Moshin first started contacted us about the launch of their brand, Ring to Cage. Their company has grown tremendously over the years with hard work and constant research and development of their products. The Ring to Cage Uppercut Bag is no exception. Allowing for multiple angles that a traditional punching bag cannot, this piece of equipment can find a home in your gym or garage to help you and your students do repetitions on the classic movement that has won championship belts around the world. 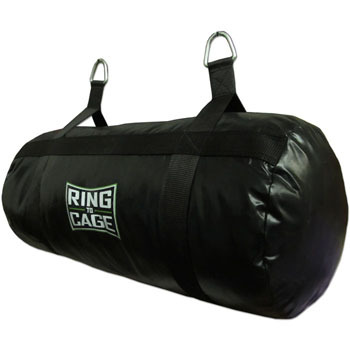 The Ring to Cage Uppercut Bag is made out of high-quality vinyl, it measures at 13 inches by 32 inches, and can weigh up to 55 to 60 pounds. As always, the Ring to Cage Uppercut Bag is available at MMA Warehouse.